It's 04:49 in Portorož, Slovenia right now. HD Stream Beach View from the Karamela Beach Bar. Portorož: Portorož Airport LJPZ, 0 miles away. Portorož: Livestream Beach, 0 miles away. Portorož: Panorama Adriatic Sea, 0 miles away. Portorož: View from the Hotel Histrion, 0 miles away. 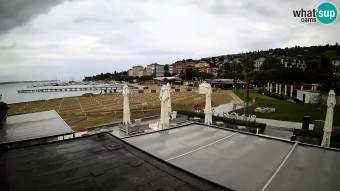 Piran: Livestream Piran Promenade, 1.5 miles away. Piran: Tartini Square, 1.5 miles away.